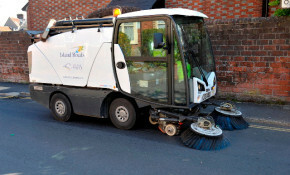 Highways PFI contractor, Island Roads, say they are keeping Island streets cleaner and greener. Urgent work is needed to stabilise the site of The Three Crowns Pub in High Street, Cowes and scaffolding will block access. Island Roads are about to start their next phase of resurfacing some of the 'most sub-standard' roads around the Isle of Wight. Island Roads are now introducing "increased measures to ensure highways dug up by third parties are re-instated to a high standard". A new road marking vehicle and crew are currently improving highway safety across the Island. Anticipation is high in Yarmouth for the road re-opening due to take place on Friday evening following extensive geo-technical work at Bouldnor. 1st April was the first anniversary of the 25 year PFI contract between the Isle of Wight council and Island Roads. Yesterday they released info about completion of the first year of winter maintenance. Traffic on a section of the Military Road near Brook has been one-way with lights since a landslide in 2010. It's good to see the water drainage system suggested by Dr Bruce Denness was a success. High profile areas adjacent busy highway will be the first to be treated. Island Roads say they hope to finish the stabilisation scheme before 4th April. There'll be a change to how residents can access their properties along Tennyson Road and Bouldnor Road as the level of work intensifies. This includes pedestrians having to use minibuses rather than go on foot. Six Islanders, aged between 16 and 24, taken on by Island Roads last September have been sharing their experiences six months into their apprenticeships.